North vs. South – Who has it tougher? I spent my whole life in Wisconsin before I moved to Arizona for my first of three grounds keeping positions for the city of Goodyear at the Cleveland Indians Player Development Complex. I made the move in February (and if you have ever experienced a Wisconsin February, you know that there is no better month in the year to head south). It wasn’t until I spent a few years without winter that I began to appreciate and miss the solitude, quietness, and overall tranquility of the season. Yes I also missed the beer, cheese curds, fish fry, and 24 hour Green Bay Packer coverage, but I’ll save that for another time. What it also taught me was that everyone doesn’t have the luxury of taking a break from their fields. I don’t know who coined the term, “things move slower in the South”, but they obviously didn’t take consideration into the fact that Northerners have 3 months where it’s perfectly acceptable to move slowly. Perhaps things move ‘’slower’ because they have to take care of their fields ALL YEAR! With that being said, I wanted to write a post with some tips for groundskeepers down south. Late fall for our southern friends brings on a variety of different tasks. 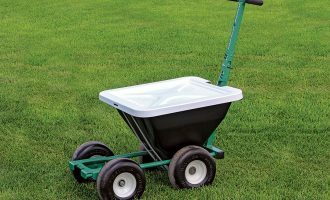 For the purposes of this post, we’ll focus in on some basic fall overseeding tips. The optimum time for overseeding, based on typical temperature patterns, has passed us. However, with the current gradual increase in average temperatures, we may begin to see that date change. Our tips today come from longtime groundskeeper, Brandon Benson. Brandon has a turf degree from Texas Tech and has spent his entire career in central California and Arizona. 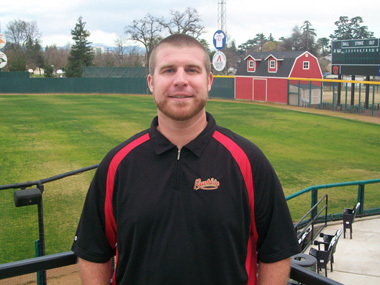 Brandon spent many seasons as the head groundskeeper for the Visalia Rawhide before moving to Arizona where he took on the role as my mentor working for the city of Goodyear (he taught me groundskeeping and I taught him in how to drink a beer after work). Brandon is now the Sports Facility Crew Leader for the city of Peoria where he oversees six baseball fields, four multipurpose fields and whole lot of common areas. Here’s what he has to say about the art of overseeding – enjoy! An enjoyable overseed experience is all in the preparation you do prior to overseeding. The first step is all about the planning and logistics. Planning is essential when dealing with multiple fields and sites that use shared equipment. Coordinating where and when equipment is used, properly scheduling employees, and deciding which fields are going to be prepped first will make it less stressful. It’s also imperative that communication occurs with the people scheduling events on your fields. 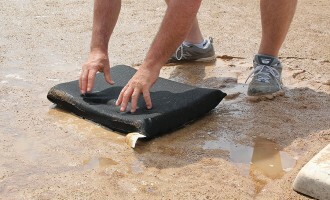 You can’t expect everyone to understand the maintenance practices of athletic fields, so communicating and educating coaches, players, and anyone else involved is a must. The last thing we want is to be watching a soccer team practice on our recently over-seeded field. Second tip is to make sure you don’t have any problems with irrigation before spreading seed. Moisture and temperature are the main factors with seed germination, and going out to the field and making irrigation repairs after your seed has been applied can damage and delay your process. With the need for moisture, our short window of time, and Mother Nature’s unavoidable delays; we must have our irrigation running optimally from the start. This ensures you won’t have any delays or missed opportunities for germination. The third tip is that no matter how much planning and preparation you do, be prepared for the unexpected. Equipment will break, the weather will not cooperate, employees will get sick. Remember these things happen and it’s important to keep a positive frame of mind. This can be easier said than done. Even though it’s easy to get frustrated with unexpected problems, you must stay positive and remember there are some things out of your control. Thank you Brandon for all those great tips! If anyone has questions for Brandon – or for Beacon staff, please post your questions in the comment section below. Brent is the national sales manager and product expert at Beacon Athletics. 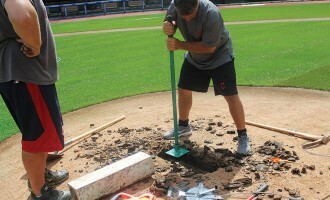 Prior to joining Beacon, Brent served as a full-time groundskeeper at the spring training stadium and player development complex for the Cleveland Indians and Cincinnati Reds. He has a degree is in Parks & Recreation Management as well as a Sports Turfgrass Management Certificate from the University of Georgia.